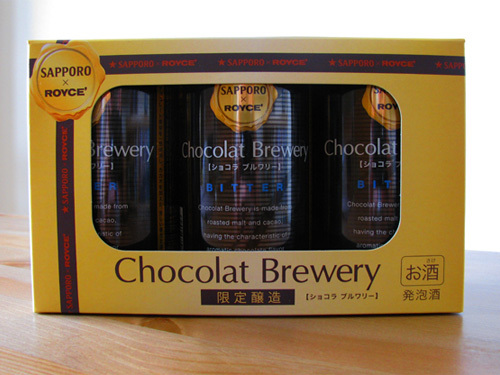 Most people, if told they could buy three cans of chocolate beer for 1480 yen (about 15 bucks) would probably just say 'meh' and move on with their lives. 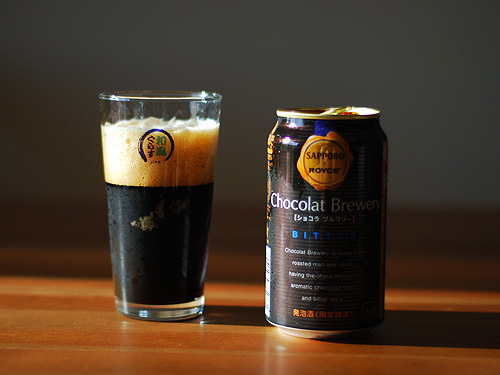 Fortunately for the guys at Sapporo (Japanese beer giant) and Royce (Japanese chocolate company) there are two types of people who are not going to say 'meh' to getting their hands on this limited edition malt flavoured chocolate beer. The first type are suckers (born every minute), and then you've got the suckers with blogs (a bit rarer, born only once a day). So anyway, unlike some websites who will just post about this second hand, I'm actually sipping a chocolate brew right now to get me in the mood for this article. Let's get started. So if not originality, what was the impetus behind this then? So why the focus on the ladies then? Well apparently, it turns out that here in Japan, they are drinking less beer these days, and Sapporo is hoping to educate a new generation of girls on the joys of getting wasted by hiding the evils of alcohol behind a screen of yummy chocolate. Let's have the verdict then! Thumbs up or down? First things first. As you can see, the can comes in a nice metallic chocolate colour and the beer itself is very dark, it almost looks like *gasp* liquid chocolate! Ok but let's cut to the chase, what does it taste like? I'll admit I expected this to be an epic failure, I mean beer goes with nuts, beer goes with chips, beer goes with steak, pizza or hamburgers, but chocolate...? I was therefore quite surprised to discover that it's not just good, but really good. The chocolate is thankfully not sweet like I was dreading, but is rich, deep and slightly bitter like pure chocolate should be. 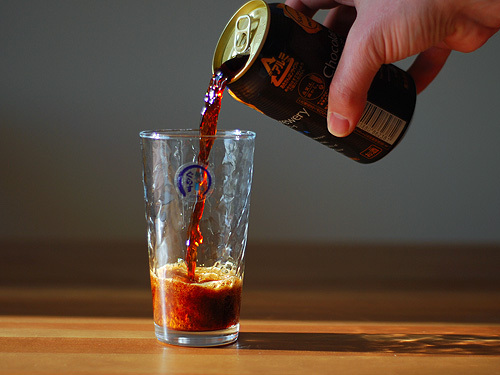 It also doesn't just compliment the beer, the malt and chocolate seem to be deeply entwined. You can tell the chocolate wasn't just added or mixed in later. The smell of rich chocolate when you open the can up is also a nice touch, and in no way seems artificial. So thumbs up! Very nicely done Sapporo and Royce! So maybe now you're thinking to take me at my word and get some for yourself? Well you won't find it in any store. The only place you can get it is online, on Sapporo's website. Unfortunately for you, Chocolat Brewery was only available for a short time, and sadly, that time is now past.... The only way you're going to get any now is to beg me for my last can! Bidding starts at 1000 yen.